If you are heading to Sauble Beach Camping you have a wide variety of campgrounds from family only operations to those that are singles friendly and only open on long weekends. I remember camping at the Sauble Falls Provincial Park when I was a teen. It was SO busy that we camped in the "overflow" area. We stuck our luggage in the tent and camped under the stars. Whether you are looking to be steps from the beach or just want a place to share some brewskis check out below for all the camping options that Sauble Beach offers. Carson's might be the best known camping spot in and around Sauble Beach. It boasts 700 camp sites each with electricity and sewars. There are seasonal trailer sites and those that are availabile by the night or week for family holidays. There are also tent sites if you don't own your own camper. 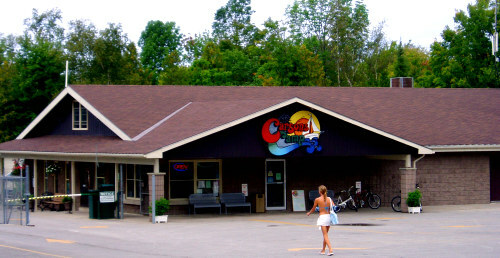 If you prefer a cottage or want to rent a trailer Carson's has that available as well. Carson's is definitely not a long weekend party location as it is open to families only and has strict quiet hours after 11 pm until 8 am. That said it is 1km from prime Sauble Beach, it has it's own lake and is within walking distance from downtown Sauble. They also have a full time activities director as well as playgrounds and splash parks. Carson's Camp is found off the Southampton Parkway. 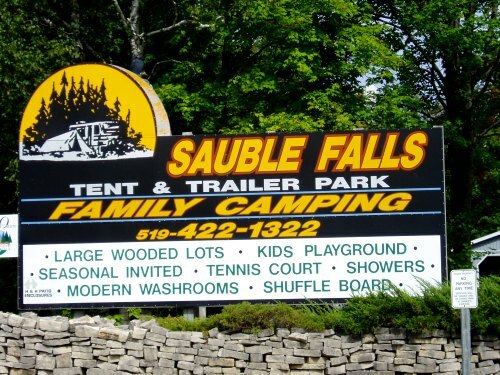 Offering more value for your money Sauble Falls Tent & Trailer Park is minutes from the beach and literally a few steps from Sauble Falls Provincial Park. 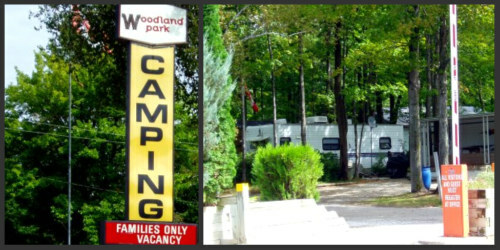 This family run campground is smaller than Carsons with only 200 sites, but offers a wider variety of camping styles. There are sites with and without electricity, cabins and tent sites. Seasonal campers are also welcome. 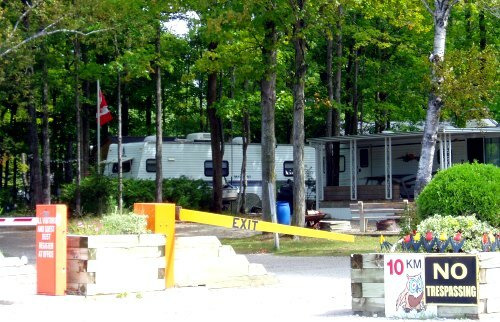 Sauble Falls is another family only Sauble Beach camping site and is open from May until Thanksgiving. 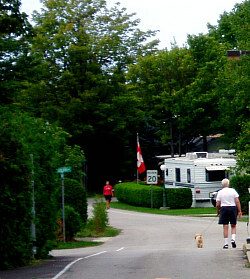 Voted the #1 campground in Canada by Trailer Life Woodland Park is the final family campground in Sauble Beach. Size wise it is actually larger than Carson's. Offering 155 transient sites and 575 seasonal sites plus 10 sites. You can even rent or buy a trailer. Stressing a clean campground and quiet after 11 this site is the closest to downtown, offers free TV, internet (additional) and telephone at seasonal lots. This is the most luxurious of the Sauble Camp sites. This campground bucks the family only trend and offers a campground that caters to singles and the party life. Watch out this place will be PACKED on a long weekend! In fact this campground is open weekends only and has no quiet hours. It is definitely a place for a party. There are rules however so don't go overboard and CANS only. The 143 Sites range in size from 5 to 25 people per site so book ahead based on your needs. The sites do not however have water or hydro but you can bring your pets. Sauble Falls Provincial Park has 152 camp sites, 49 of which have electrical hook ups and there are 2 group sites. This is an excellent site for novice canoeists and wildlife lovers as the Sauble Falls is a beautiful site to experience. 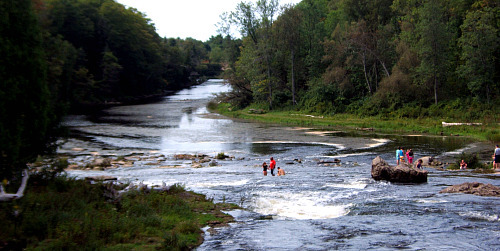 Hiking trails or swimming in the Sauble River, this is camping for outdoors lovers. If you are looking for other Sauble Beach Camping options you can head towards Southampton, Oliphant or Owen Sound for more choices. Return HOME Sauble Beach Camping.